In order to make his project a reality, Jaime Colsa has worked with two curators to develop the two lines of work in the Truck Art Project. The one that gave the project shape, urban art, is undertaken with total freedom in the streets and open spaces. Óscar Sanz is in charge of setting the guidelines for this field. Because he’s in charge of a team working in the urban art field, but also closely involved with brands and event organizing, Colsa found him to be “the best person to get the job done”. Sanz, the guiding force behind Ink And Movement, has always known what his role is in terms of brands and events, which he calls “a type of dirty work,” that’s necessary “in order to obtain financial resources and move forward with the projects that I really want to do”. And those projects include ones like TruckArtProject. The path for Sanz and his team hasn’t been easy, but it’s been worth it. While still in college they set up Plural Form, and while they struggled in the ‘90’s to get the kind of work they were doing validated, in 2003 they organized the first meeting of graffiti artists, gathering more than sixty artists in two editions in a little town close to the Las Palmas airport to completely rearrange it. At that time these types of events, which are so prevalent today, did not exist. In a matter of only twelve years, the project has been consolidated. “After that, we were able to gain a foothold to position ourselves and give more visibility to our project”. Thus, in 2006 they set up Ink and Movement, organizing exhibitions all over the world with different artists, and showing a more traditional side of these artists in a context like the gallery, with an open space in Madrid for three years. “But I found myself in a very static environment, whereas we were provocateurs. That’s why we decided to start doing pop art exhibitions from time to time, such as ARCO, participating in exhibition fairs, and continuing to develop projects without a fixed headquarters”. They feel very comfortable regarding Jaime Colsa’s initiative, since it’s not the first time they’ve collaborated with the collector: “We’ve worked with him for a long time on a bunch of exchanges”. The challenge was to give the artists involved the necessary support to work with, the foundations with which to make what worked on paper into a reality. “Honestly, when we started TruckArtProject, we did it without pretension. We were just up for doing something like that, and I think the majority of the artists felt the same way. They fell in love with the idea as soon as we proposed it. And we just did our thing, regardless of who we were working with and their importance on the art scene”. “When Colsa talked to us about the possibility of working on trucks and putting artworks on them, it was clear to us. There are two fetishes in the graffiti world (the real ancestor of what we know as urban art): trains and trucks”. “In a project like TruckArtProject, the possibilities don’t end at doing the work on the trucks, because we’re talking about “art in motion”, which means bringing it to environments where it doesn’t usually go, and breaking down certain barriers in terms of the way that some people see art as something inaccessible”. The intention, says Sanz, is just the opposite: “We think it has “mobility” in its DNA; it also does something we’ve been aiming at for a long time: combining two worlds that are like two sides of the same coin: more traditional art and urban art”. One has only to look at other projects he has done, which have put together artists like José Luis Serzo and Okuda, working together as equals. TruckArtProject takes that same conversation to artists like the painter Abraham Lacalle and an urban artist like Suso33. 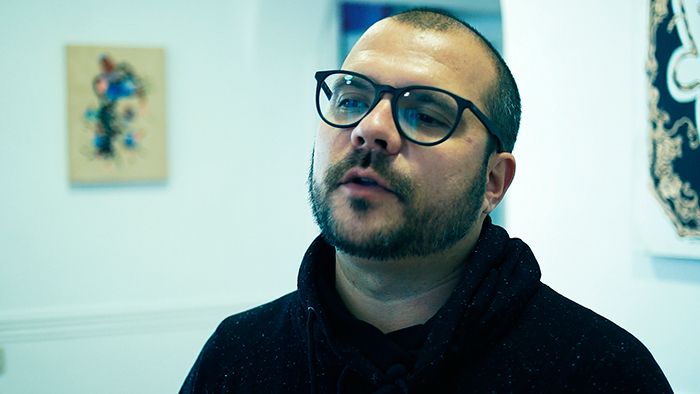 According to Sanz, there are other interesting factors that make a project like this appealing: “For example, there’s the possibility of dealing with other cultural agents, which allows us to bring urban art to environments that you don’t usually see it in, or that have had their backs turned to it". Another success of this initiative is that its reception is natural, “because we receive stimuli like this daily without even noticing it.” And it introduces a new perspective to the debate: “This is where what Marina Vargas has called “the vertigo aesthetic” comes into play. That is, works designed to be viewed very fleetingly, but also the idea that the creation of the work is subject to very specific timeframes. The work of the traditional artist is governed by stasis. This is exactly the opposite: mobility. That’s an interesting challenge”. Sanz recalls how TruckArtProject got started: “There are no guidelines, or only minimal ones: paint the sides of the trucks. Apart from that, the theme and technique is open-ended. We’ve learned that artists tend to break with accuracy, to experiment… That’s what’s interesting about a project like this one; it’s one more poke in the eye of the established norms”. The curator likens the project’s mobility to the reality of the day-to-day of a graffiti artist: “When someone paints a train they know its route and they go the specific station, at the specific time, to make a good picture. We wanted to create a nod to that in the app for the project, where the user will receive alerts from their favorite artists or from all the participants, and they’ll be able to find out which artist will be close to where they live at any time”.